Kentucky Moonshine gives the Brothers Ritz an opportunity to carry a film with star billing. Unfortunately they don't rise to the occasion and even Darryl Zanuck pads the film with young lovers Tony Martin and Marjorie Weaver. In these programming decisions that are made sometime, radio executives are worried about band-leader/singer Tony Martin's slipping ratings. It seems there's a glut of swing music on the market. Tony gets the idea that maybe real hillbilly music and offers to go to the hills of Kentucky to find some real hillbilly acts. Marjorie Weaver who's waiting outside a casting office gets wind of the scheme and goes back to Kentucky where she's actually from to be discovered. Her fellow boarders at a theatrical rooming house the Ritz Brothers go back to the hills of Eastern Kentucky with her though they'd really be more at home in the East New York section of Brooklyn. Of course after a series of mishaps it all works out in the end. 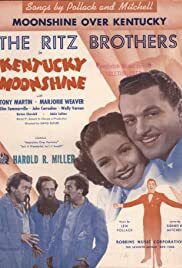 The last fifteen minutes or so of the film are exclusively the Ritz Brothers as they take over Martin's program with their usual brand of monkeyshines. Included in that is a Ritz dramatization of Snow White with bits of the Disney score that Mr. Zanuck probably had to shell out big bucks for. The problem the Ritz Brothers have is that unlike the Three Stooges or the three Marx Brothers, the Ritzes themselves have no individual personality. There stuff at times can be funny and it's amusing here. But it's not the stuff classic comedy is made. Tony Martin begins the film with a version of the Prologue from Pagliacci which was a hit for him and which he later sang in Two Tickets to Broadway. He was trying a mustache for this film which he promptly discarded. The rest of the musical score is singularly unoriginal. I'm sure no one left the theater in 1938 when Kentucky Moonshine was showing with one of 20th Century Fox's A budget features. Still it's not likely to be discovered and herald a revival of the Ritz Brothers.